The example will be implemented on Yii2 basic, to implement it on Yii2 advanced , you need to change the file location corresponding to the advanced template and namespace. Install Yii2 basic, Short instruction. How to install Yii 2 basic. The feedback form in the pop-up window will work on every page of the site, so we create a widget that will initialize the ContactForm model, send a message if the form is correctly filled in and show notify to the user (visitor to the site). The contents of the widget class FBFWidget is a simple widget with code for initializing, checking and sending the feedback form, the code is almost identical to the content of the actionContact class (controller) SiteController (app/controllers/SiteController.php). The view contains two simple modal bootstrap windows. The first contains a message about the successful sending and is automatically displayed when sent, the second contains the feedback form itself (the form code is identical to the form from the contact view (app/views/site/contacts.php)). Next, in the main layout (app/views/layouts/main.php), add the initialization of the widget and the link (or button) to call the popup (modal) window with the feedback form. 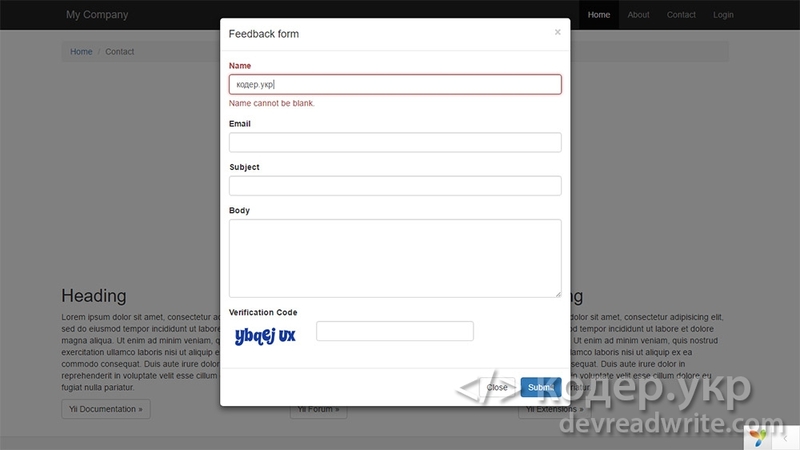 The feedback form in the popup window for Yii2 is ready, an example with the source code can be downloaded from github: https://github.com/devreadwrite/yii2-fbf-in-modal. bro, it worked and thank you for sharing your knowledge, bro, can you please help me to call the feedback form by bootstrap button? how can I give these parametres 'url' => '#', 'options' => ['data-toggle' => 'modal', 'data-target' => '#myModal to bootstrap button and make it work? I followed the example here and I was able to create a contact widget that I added it above the footer of multiple pages on my website using the code `<?= FBFWidget::widget() ?>`. I stripped the code of the modal box so I am not using that. The problem I am facing now is that whenever I opened a webpage, the page jumps straight to the contact form at the footer instead of showing the top of the page as a any normal browser should do. How can I stop this problem?